Prince, 57, died on Queen Elizabeth II’s 90th birthday, April 21, 2016. In a tribute that was an intriguing "coincidence" at Niagara Falls, it was switched and used by officialdom to honor Prince. Okay, what time did the world learn about Prince's death? At 9.43 a.m. The Carver County Sheriff's Office received at 911 call from an unidentified male requesting an ambulance be sent to Prince's Paisley Park home/studio. 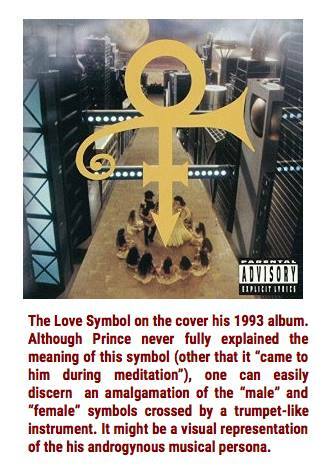 The male initially said Prince was unconscious, later in the same call he said he was dead. Emergency services arrived, CPR was administered, he was unresponsive and at 10.07 he was pronounced dead. 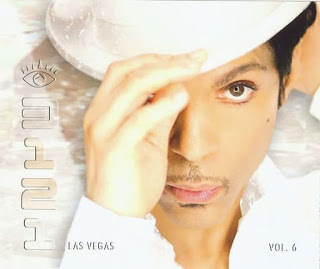 Prince of course sang Purple Rain, and he was obsessed with the colour purple and was often shown either wearing purple or bathed in purple light. 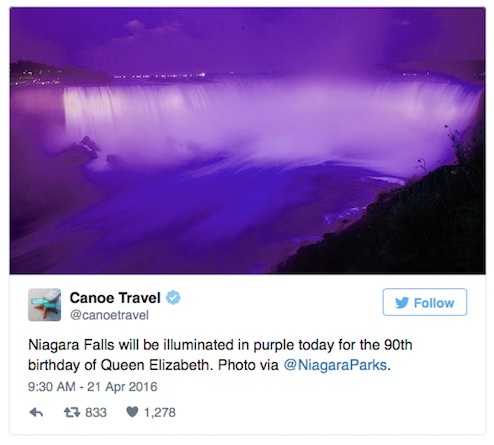 On the day Prince died, Niagara Falls was one of many places that was bathed in Purple light, Prince fans thought this "Purple Rain" was to honour their hero, turns out it had nothing to do with Prince, it was to mark the 90th Birthday of Queen Elizabeth, and honour her REIGN! 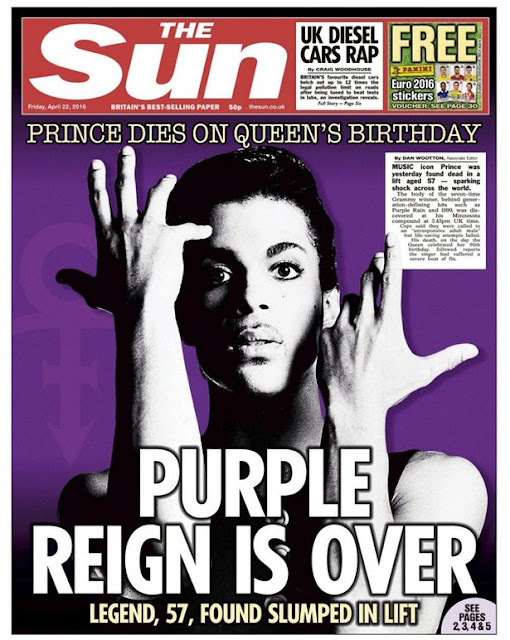 The first release of the news of the death of Prince was at "4/21/2016 9:49 AM PDT BY TMZ STAFF." 9:49 AM PDT would be 11:49 AM CDT, local time in Minnesota. 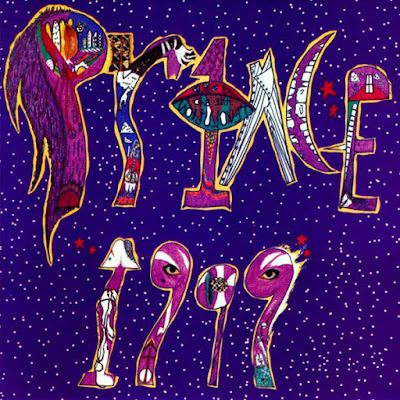 "The Prince autopsy press conference is taking place in Chaska, Minnesota. Chaska can transpose to 'akashas.'" ~ Johnny Walsh. Then there is the matter of the elevators. 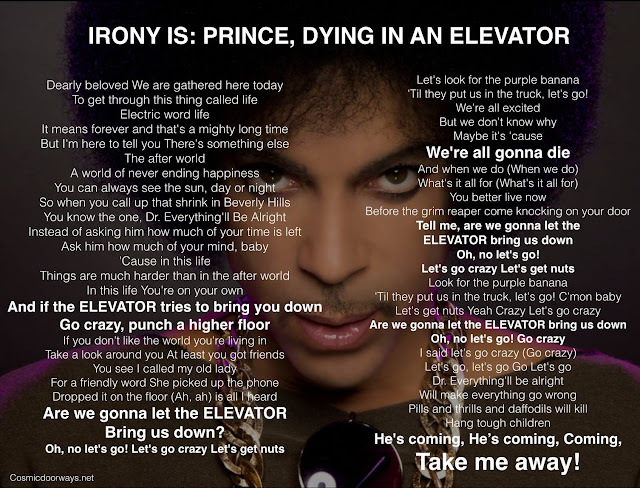 Music icon Prince was pronounced dead shortly after being found unresponsive in an elevator in his Paisley Park compound in Minneapolis. That detail is haunting fans who point to the bizarre connection to a line in his hit song, "Let's Go Crazy," in which he sings, "Are we gonna let the elevator bring us down? Oh, no, let's go." But for music producer L.A. Reid, the "spooky" coincidence also reminds him of one conversation he had with the late artist. "One time I was with him privately and he said, 'You know what the elevator is right?'" Reid recalled. "He said. 'Well, the elevator is the devil...' And so for me it was like really haunting when I read that he was found in an elevator." Source. 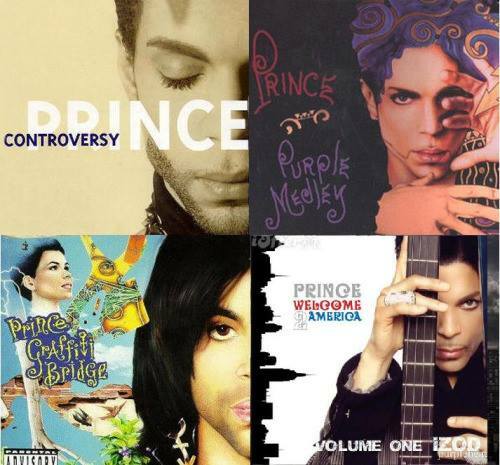 See my earlier blog about Prince's death, here. Thanks to my Twilight Language and FB/Kitchen Sync research associates. Let's not forget the Princely contribution to the original Batman movie soundtrack (directed by Tim Burton 1989). 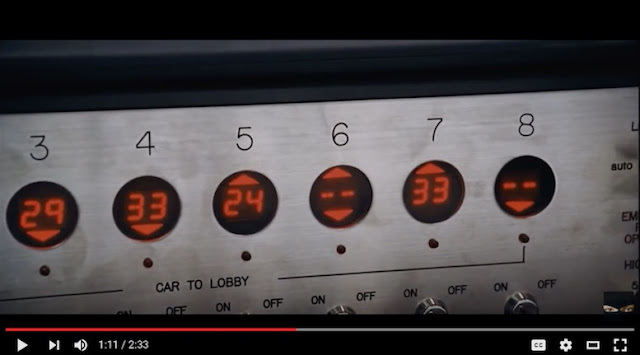 Even starring as the Joker/Two-Face/Batman in the music video..
Also worth noting that in the movie, after the opening credits (of which Prince gets a shout out), we are introduced to Batman bursting out of an elevator to fight Two-Face and his henchmen. In the music video, there is a creepy scene with dancing Jokers holding guns. Was Purple Dawn a prequel to the Red variety? Perhaps a new Prince was Knighted in the process..
Those inferno machines have always creeped me out my whole life. Didn't James Shelby Downard once comment on the sorcerous implications of elevators? Nobody has ever elaborated on elevators and sorcery. I assume sorcery is black arts occult related stuff.